Should You Die with Student Loans? I’ve increasingly received emails from borrowers in their 60s and even 70s who owe more than six figures of student loans. They want to retire, but they think they’ll never be able to afford to. Some have even considered the possibility that they will die with student loans. Maybe you have a bunch of student loan debt and think you’ll be taking it to the grave. What’s crazy is in rare cases, is that if you die with student debt it can help you to achieve your financial goals. You can protect your family with some additional planning that will allow you to live the life you want no matter how messed up your finances are. While understanding what happens to student loans when you die is important, no one under the age of 50 in good health should dare to think of this strategy. This is primarily for borrowers who owed more than they ever dreamed possible while going into their golden years. I realize how nuts the claim that dying with student debt could be ok sounds. Stick with me to see how certain borrowers could quit their jobs and retire thanks to math. What Happens When You Die With Student Loans? With federal student loans, the government forgives the debt completely. Your family does not need to worry about having to pay back that kind of debt, even if it’s hundreds of thousands of dollars. Private student loan lenders almost always forgive the debt too. The problem is that their promissory notes (the contract you signed when you agreed to the debt) often do not require them to grant a student loan discharge due to death. President Trump recently signed a bill that vastly expands protections for private student loans when the borrower or cosigner dies. I expect that for loans take out in 2019 and beyond, worrying about what’s in the loan contract won’t matter. If you die, your family won’t be on the hook. See what the lender says about dying with the debt. If they don’t say anything, ask their customer service reps what happens if you died before the loans get paid off. The reality is that no lender wants to show up in the news asking a widow or widower for money they don’t have. Effectively, having your student loans forgiven due to death is something you shouldn’t worry about. It will happen. If you’re the kind that worries anyway, buy a term life insurance plan for $20 to $40 a month. This can help protect your spouse from inheriting student loan debt. I got $1 million in protection with Haven Life and you could get as much as $2 million. I suggest you have at least 8 times your salary in coverage if you have a family depending on your income. There are two ways to get loan forgiveness. One is through the Public Service Loan Forgiveness (PSLF) program. The other is by paying for 20-25 years on an income-driven plan and then paying taxes on the forgiven balance at the end. With PSLF, you need to pay for 10 years on an income-driven plan while working at a not for profit or government employer. At the end of the 10-year period, the government writes off the remaining balance tax-free. The problem is that PSLF requires full-time employment for a decade. If you’re already approaching retirement, that might be something you’re not interested in doing. Another complication is that you might not have qualifying loans. Parent Plus loans must be consolidated and paid on the ICR program to be eligible. You could have years of credit working in the right kind of employer but still not receive the PSLF benefit in this case. For Direct loans in your own name, you would have more repayment options and would be more likely to receive credit without extra work. Let’s say you want to get loan forgiveness but work in the private sector or will retire before receiving 10 years’ credit towards PSLF. If you have no credit towards loan forgiveness and are entering repayment for the first time, then you’ll need to pay based on your income for 20 years on the Pay As You Earn (PAYE) program and 25 years on the Revised Pay As You Earn (REPAYE) or Income Contingent Repayment (ICR) program. At the end of that period, the forgiven balance is taxable income. That scares a lot of people who are terrified by the prospect of receiving a six-figure tax bill due all in one year. Unless you sadly have some health condition where you don’t expect to live a long time, you should never think about dying with your debt as a strategy if you’re under 50. If you can afford to easily pay back your debt above 50, you should. Most people above 50 live long, healthy lives. Going for PSLF is a straightforward strategy that would require extending your working career until you receive the benefit. That’s why I’m going to focus on the strategy of paying your loans for 20-25 years because it applies to everyone. 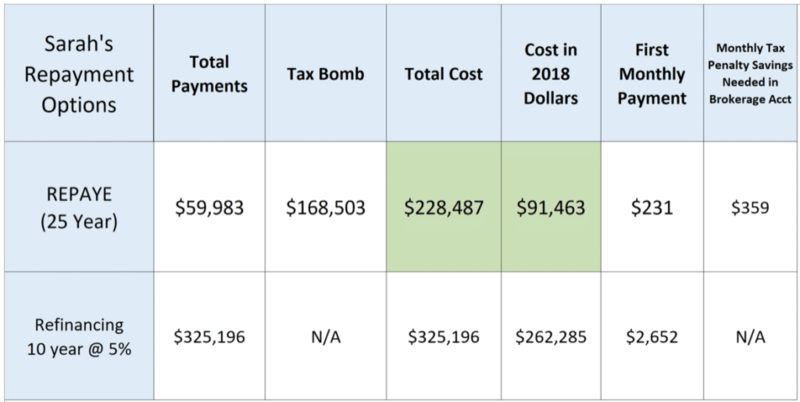 Loophole #1: You do not have to be employed to receive credit towards the 20-25 year loan forgiveness with the tax bomb. That means a retiree living on Social Security could pay a nominal amount of $100-$200 a month and receive credit towards loan forgiveness. Loophole #2: The IRS has something called an insolvency rule. The rule states that if you have forgiven debt that’s taxable income, you have to be solvent to be taxed. That means if you owe more in debt than you do in assets, the debt gets wiped away tax-free. Loophole #3: Would you rather be dead or have to deal with a tax payment plan with the IRS? Borrowers in their 60s or 70s are bound as all of us are by actuarial tables. If there’s a 50/50 chance you’d have to pay a tax bomb and you do end up living that long, you’ve won. I’m not trying to make you feel awkward or be worried about your own mortality. I want you to be able to afford to retire or work fewer hours even if you owe more than $100,000. Who is the “Die with Student Loans” Scenario Best For? The “dying with debt” strategy could make a lot of sense for near-retirees with less than $1 million in assets who owe more than $100,000 in student debt. If that’s you, then you’re not alone. About 30% of seniors have no retirement savings, according to the Government Accountability Office. The ones who do have close to $150,000 on average. According to Dept of Education data that we’ve interpreted, there are about 3.5 million Parent Plus borrowers in the US. Many median age adults and seniors go back to school themselves for career transitions and take out Direct Federal Loans in their own name. That means there are likely hundreds of thousands of borrowers out there who are in their 50s, 60s, or 70s who have six figures of student debt. If you had to borrow to fund education for yourself or your children, then that means it’s likely you have less than $1 million in assets. In fact, almost every single borrower without much payment credit to loan forgiveness, who wants to retire soon, and is over age 60 could use the “die with debt” strategy. That would create enormous losses for taxpayers in the federal student loan portfolio, but it would allow borrowers to claim their financial security back. Here’s what the Social Security Administration says about the number of years they expect you to live at certain ages. Notice that the Social Security Administration expects the average 60-year-old woman to have 25 years left on Earth. Assume there’s nothing special about the population who borrows for themselves or for their children for college. That would mean the average female borrower with Parent PLUS loans over $100,000 and with low income would have a 50/50 chance of never needing to worry about the student loan tax bomb that happens at forgiveness. Notice that men live fewer years than women. If you’re in your mid-60s, then men can expect to live another 18 years. That means the majority of men at 65 who have student debt and whose payments based on their income are low could expect to die still owing student debt. If you live longer than the Social Security Administration expects, you should not worry about tax penalties. Let’s switch to looking at examples of how this “die with student loans” strategy would work. Let’s assume that Jim is a sales executive at a small business and would love to retire in two years. He sent his three children to private Catholic liberal arts schools in the Northeast. All of them entered low paying careers, and there is no way to transfer the debt to the children without refinancing. Jim really doesn’t want to put the burden on his children in that way. Jim also desperately wants to get rid of the debt, but it’s all Parent Plus loans at $300,000 at a 7.5% interest rate. Jim has no mortgage and about $200,000 saved in his 401k because of a divorce. He feels distressed that the only path forward is to work until the student loans are gone. He has no credit towards forgiveness yet. Jim decides to consolidate his Parent PLUS loans into a Direct Consolidation loan to get access to the ICR plan. If he paid back the Parent Plus loans the old-fashioned way, he would need to pay about $3,200 a month for 10 years. Finally, he’d be debt free and might even have some extra 401k savings to use towards retirement. The problem is that he would have to work until 73. What if he lost his job or burned out before then? Alternatively, I’ll suggest that Jim plans a radical strategy where he could potentially die with the debt, but he’ll have a backup plan. Jim will work two more years and delay Social Security until age 70. The reason is that he would receive a higher benefit than if he claimed it at the full retirement age. Instead of taking Social Security at age 66 and getting a benefit of $2,600, Jim will receive a benefit of about $3,400 a month at 70. Jim will live on his retirement savings until he hits age 70. Since Jim’s taxable income is so low and he’s relying on Social Security exclusively, his income for purposes of student loan income contingent repayment would be close to $0. His only significant payments on ICR come in the final 2 years he works. He might even be able to avoid these payments with a forbearance. Notice that Jim only pays about $44,000 on his Parent Plus loans. They grow from $300,000 to $817,000 over 25 years. He would then owe about $327,000 in taxes in a 40% tax bracket. Here’s where reality steps in though. Based on Social Security’s data, there’s a better than 50% chance that Jim doesn’t live until the tax bomb hits him at 88. If it does, Jim’s liabilities will be greater than his assets, and the government would forgive the debt without tax. If it didn’t, then the cost in today’s dollars would be half as much as if Jim paid it all back. Jim could put away $600 a month in an index fund account to pay the tax bill if he was that worried about it. What will Jim do for nursing home expenses? A dirty little secret of America is that the majority of the middle class relies on Medicaid to cover these bills. There would be significant barriers to doing this strategy that would be primarily rooted in pride. Jim probably never dreamed of himself as someone who would need to rely on any government programs to have good options financially in his life. However, his alternative is working for another 10 years, 8 years past his desired retirement date. That’s a huge chunk of his life expectancy that he’s devoting to work that he’d probably rather not do. By using this dying with student debt strategy, Jim could use those 8 years to travel, relax, and enjoy family and friends instead. Sarah went to law school during the recession because she got laid off from her corporate marketing job. She always wanted to try something else, and Sarah has always thought she would retire at 70. She has made some choices she wishes she could take back with forbearance and deferment. She only has two years of credit toward loan forgiveness on the Revised Pay As You Earn (REPAYE) plan for her Direct federal loans as a result. Sarah’s debt is $250,000 at a 7% interest rate. Sarah earns $70,000 a year and will make about $40,000 a year in retirement from a combination of retirement income and Social Security. Sarah owns her $250,000 house. We’ll assume Sarah saves the max of $24,500 a year in retirement. Most women in her family live past 90. Sarah is very concerned that she won’t be able to retire at all because of her huge law school debt. Here’s what the cost of REPAYE vs paying it all back looks like for Sarah. Notice that Sarah would only have to pay about $60,000 until 2041 since she already has two years of credit. We’re assuming that Sarah lives past 90 and that she would need to figure out the tax bomb at that age. Even if she had to pay the $168,000 taxes all at once, her cost in today’s dollars would be about $91,000 vs $262,000 in today’s dollars if she refinanced. If you’re Sarah, which option do you choose? Paying 50% of your take-home pay to your loans and work another 10 years? Or do you retire in 5 years then roll the dice with your life expectancy and gamble on the student loan rules? I view it as highly unlikely that the IRS comes after a 90-year-old woman for a tax bill if she doesn’t have the assets to pay said bill. Is Dying with Your Student Loans a Terrible Idea, and Is It Immoral? I would never suggest to anyone that they use this strategy on purpose if they have enough time to plan otherwise. I would also suggest a modification to the title of this strategy. It’s the “Die with Student Loans or Live and Deal with the IRS” strategy. If you live and have to deal with the IRS when you get the tax bill from the forgiven balance, you win. If you’re dead, you haven’t won but you don’t have to worry about the debt affecting your family. Imagine the optics of the IRS trying to collect taxes from elderly persons without substantial assets. If you have millions in retirement savings they’ll get their money. However, if you’re a typical middle-class American, at the very worst they would set up a payment plan. Most likely, they would write off the debt and you would be relying on Medicaid to pay for Social Security expenses anyway. Taking advantage of the loopholes in the student loan system is not immoral any more than utilizing the tax code to legally pay as little as possible in taxes. If you dislike the system lawmakers created and think people should not be able to do the strategy that I outlined, call your representative and let them know that. If you are one of the hundreds of thousands if not millions of borrowers over 60 with student loans, you plan to live on Social Security, you have less than $1 million in assets, and you’d rather roll the dice so you can retire before your mid-70s, this strategy could be for you. We specialize in making custom plans for borrowers in six figures of student debt . We care exclusively about getting the lowest cost for borrowers and helping you figure out how to achieve what you want to in life when you owe more than $100,000 of student debt. If you’re interested in more info about this service, contact us so you don’t have to figure out this needlessly complex system alone.